D’SCENE Magazine’s fashion editor Christopher Maul heads to Paris to meet with Baptiste Giabiconi to talk music, modelling and his relationship with Karl Lagerfeld. Six years ago I opened the pages of Purple Magazine and a shoot stopped me in my tracks. The session, captured by Karl Lagerfeld and art directed by Oliver Zahm, challenged every misconception I held about masculinity and it sparked an interest in fashion. Not your average editorial, the homage to the Helmut Newton Woman starred Baptiste Giabiconi in little else but black stilettos. Though innovative, this had been done before. The story took me back to my childhood when I would shuffle around in my mother’s heels. Swamped by an oversized shirt cinched in at the waist with a bath-robe cord, I would pose on the stairs with one hand against the bannister. My take on the look was less fierce than Giabiconi, but more endearing. To my despair, photos of this were the main attraction of the family album and my parents would revel in their show-and-tell, but I’ve since come to terms with this experimental phase of dressing. With one click of the shutter Lagerfeld justified years of fancy dress – if Baptiste can do it with style, then why can’t we? He’s no stranger to heels. In 2009 he was at it again – he appeared in Vogue Paris working sky-high shoes and somehow it looked effortless. It’s a look only he could pull off. Though he has pins most women would envy, this shoot for D’SCENE, styled by me and shot by Franck Glenisson, sees his feet firmly flat on the ground. Modelling was never on the cards. Before his foray into fashion, Baptiste obtained a professional Baccalaureate in ‘Accueil et Service’ and trained for six months in aeronautics. The fashion world was unknown to him and his upbringing was largely untouched by it. “My parents have nothing to do with fashion – it’s a different world and they work away from it. I guess they lead an ordinary life,” he says. His parents, both from Corsica, can be thanked for his Roman looks. “I wouldn’t say they influenced me to go into fashion at all,” he continues, before sitting down next to me on the sofa. Cyril Nanino [today’s hair stylist] gets to work on his mane, brushing his fringe forward into a dishevelled wet look. The start of his career was explosive. Raised in Marseille, France, he signed to DNA Models in New York in 2008 and modelled for the Frankie Morello spring ad campaign. He soon became the gem of the male modelling world and has faced campaigns for the likes of Roberto Cavalli, Fendi and Chanel and been shot for titles such as Vogue, Elle, V Man and L’Officiel Hommes. This success all comes down to one man – the ball was set rolling for Baptiste after Karl Lagerfeld adopted him as his muse, replacing top model Brad Kroenig. He has a lot to thank Lagerfeld for. “I’m certain that I would have had another career, another path in life had I not met Karl. Before meeting him it was hard in this industry and little was set in stone but it is him who put my foot on the ladder,” Baptiste explains. He slips the Serena Gilli vest over his head before he swishing it around with his distinctive joie de vivre, his feline features curling into a smile. “He gave me the strength to be able to become someone in this domain.” From day one Lagerfeld put him under his wing. If the fashion world was a concert, Lagerfeld found Baptiste, took him by the arm and dragged him through the crowd of revellers before pushing him on stage. With a powerful friend clearing the way for him, it was a smooth ride to the top of the industry for Giabiconi. The pair are still close. “The relationship I have with him is a true friendship,” he says. He sits down and checks his Twitter account, of which he has 2 million followers, before we change him into the Xander Zhou shirt and Prada trousers ensemble.“I admire his work and he have a faithful working relationship.” Subsequently, he is the face of Karl Lagerfeld this season. Karl isn’t the only one. Leagues of industry heavyweights have fallen under his spell – when supermodel Naomi Campbell met him in Moscow she was equally enamoured by his charm. “It’s not right: We all have defects. You have none,” she said. Working with the elite on a daily basis is the main perk of his job. “I’m lucky enough to work with various people and very big photographers. It is a beautiful experience,” he says. Not just a model, Baptiste has a budding music career. In 2012 he signed with Warner Music and released his debut album, Oxygen. The record went straight to number one in France and made him a household name in his home country. His second album, Une Homme Libre, was completely in French but he’s now working on a future release for 2016, which he hopes will have more international appeal. “I am influenced by all styles of music and my taste is really varied. I like listening to old artists such as Bowie, George Michael or The Beatles but I also like the artists of today such as Maroon 5,” he says. He won’t compromise. When asked which passion of his comes first, modelling or music, his answer leaves no prisoners. “People have been asking me this for five years. I don’t need to choose. I just do both,” he says. 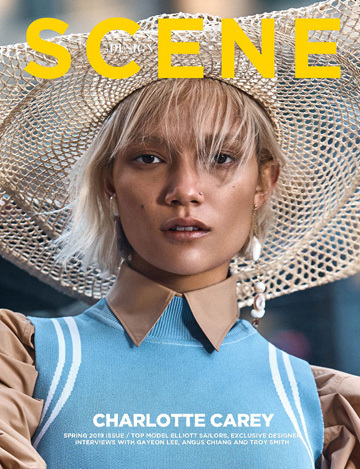 Fashion Magazine D’SCENE Summer 2015 issue Featuring Supermodels Baptiste Giabiconi, Brad Kroenig in a total of 30 top model names. For the session Christopher selected pieces from Prada, Xander Zhou, Sibling (cover look), Tourne de Transmission, Just Cavalli, John Varvatos, Roberto Cavalli, Bobby Abley, Agi & Sam, Samsoe & Samsoe, BLK DNM, Joanna Startek, Issey Miyake, Casely-Hayford and Calvin Klein to name a few. New issue features Baptiste on the cover and a 10 page editorial – in a total of 120 pages of Summer 2015 fashion.